The Frejac side chest is the perfect piece for beside your bed. 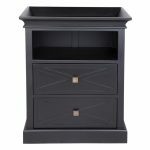 The stylish cross front drawers and lipped top will work perfectly with a stylish lamp and decorative books. Complete the look with the matching Tall Boy or Commode for a stylishly coordinated boudoir. The Frejac side chest is available in Chalk or Black.